Here’s a fun project for summer stitching! If you’re familiar with chicken scratch embroidery, I think you’ll love this adorable chicken scratch border that features watermelons embroidered on gingham with chicken scratch techniques. If you’re not familiar with chicken scratch, no problem! It’s a very simple style of embroidery that creates a lacy look on gingham fabric. You can learn all about it through these articles, tutorials, and projects for chicken scratch embroidery. So many possibilities with this humble, pretty, embroidery style! Since it’s summer (at least here in the Northern Hemisphere), it’s a perfect time for watermelon! And of course, any time of the year is a perfect time for embroidery. 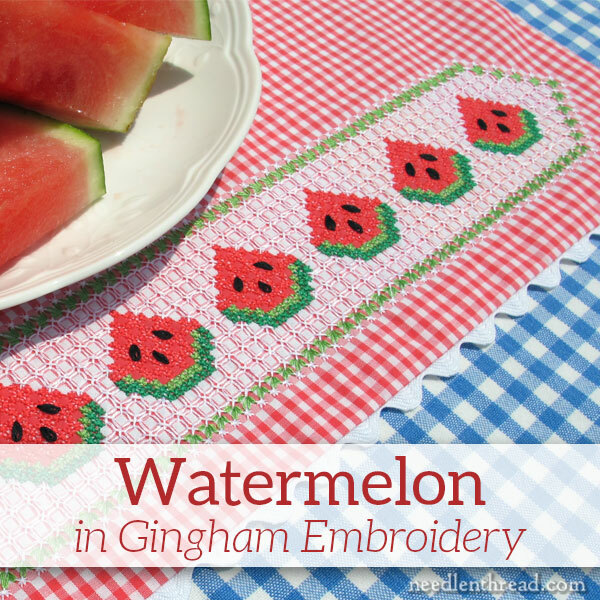 In my tutorial for watermelon in gingham embroidery, I cover all the supplies you’ll need for a small table runner, along with all the stitch instructions and a chart for stitching up the design. It’s a super-fun design to stitch. You can apply the design to anything made of gingham, really. It doesn’t have to be a table runner. Picnic napkins, a child’s play dress, your kitchen curtains, a favorite apron with a vintage flair … anywhere you want to create a splash of color with gingham while paying tribute to an iconic summer fruit! Incidentally, you can also work the watermelon design on any color of gingham, so if red or watermelon pink aren’t exactly your Color Thing, no worries! While I was working up samples of the pattern, I tried it on a natural gingham linen, a turquoise gingham, and a yellow gingham, along with regular red and watermelon pink. I settled on the watermelon pink gingham for the finished sample because the color was so cheery and summery. But any color of gingham will work. 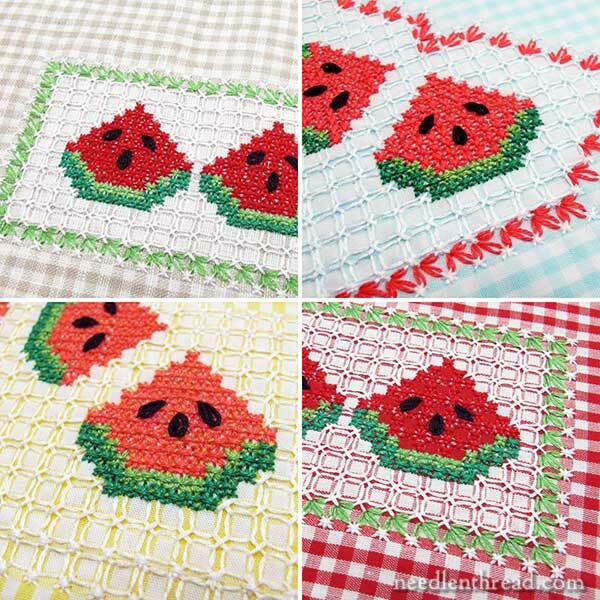 Update 2017: I’ve posted the tutorial for Watermelon in Gingham Embroidery here on Needle ‘n Thread, along with the pattern and links, so that you can easily access it and use it. The watermelon pattern is a creative use of gingham and colors. I cannot believe the colored squares disappear. What a shame you cannot print or download from the DMC site. Will you post the project on your site? Hi, Miriam – I thought they would include the PDF for the pattern, but I notice there’s no link to it. I’ll email them and ask if they are going to post that. You can also right click on the pattern picture and save it to your computer and print it. What a fabulously fresh and updated approach to gingham embroidery. Well done, Mary! Mary – this is such a cute pattern – so summery and fresh! Yiur tutorial is really great, wonderful detail. I really would like to make this. Congratulations and Best Wishes on teaming up with DMC Mary. Think you’ve started something…everyone taking up Gingham embroidery. This is PERFECT for my sister-in-law’s Girl Scout troop! I’m supposed to be a guest instructor this month, and have been wondering what in the world I could come up with that all the girls would both enjoy and learn from. THANK YOU!!! Liz, I taught a girl’s group for quite awhile and we made gingham bookmarks. I find for kids, it helps to use the 1/4″ checks. The smaller checks are more delicate, but more difficult for beginners, especially children. In my Guide to Gingham Embroidery ebook, there are directions that you are free to copy for all your students. We made “Mom” and “Dad” bookmarks because it was easy to stitch in an hour or so and they gave them as gifts. Another time, I used about a 6 x 8″ artist’s canvas (on sale at Michaels at the time) and cut the gingham larger than that and that gave the girls enough room to stitch their names (up to about 6 letters). When they were done, we stretched it over the canvas and stapled it on the back. Simple and fun! Good luck with your Girl Scouts! They are blessed to have you teach them! You’re so cruel. Such a lovely tutorial and not a scrap of Gingham in the house… living in a tiny rural village doesn’t help much either. Will have to go into town one of the next days! Oh, Mary, this is darling! Just goes to show how many beautiful stitches can be done on gingham! Wanted to print it, but it’s 48 pages!! Is there a printer-friendly version? A great blog and excellent instructions and a great piece of embroidery, this would look lovely on any table especially a garden table with lovely melons surrounding it. I love the different coloured ginghams cloths which show the same red coloured melons, which all blend in nicely. I really like the rickrack edging it really compliments the whole design, a great piece of embroidery and very creative Mary and beautiful stitching. Thanks for sharing you gingham design and embroidery on DMC common thread. I popped over to Commonthread by DMC. What a great tutorial! Your chicken scratch looks so much better than mine. These watermelons are just fun! That is so cute and I love it. I too would appreciate a pdf! I need to make it! This is great! As always, your directions are very clear and I really like the detailed photos of each stitch near the bottom of the webpage. I am a “visual” learner and these photos make the “how to do” the stitch combos very clear! Nice job, Mary! Thank you for pointing us to this wonderful tut. Not only is the design adorable, it looks as if you’ve covered everything including all the stitches. Cute, cute, cute. Thanks for sharing. Gingham embroidery, so classic! Fantastic job Mary! Of course your instructions are always excellent so I didn’t expect anything less. These are instructions that anyone should be able to follow. The pictures alone can walk anyone through it. Congrats on the new gig and a job well done. Very clever Mary! Looks cool & delicious, a perfect summer project. Mary, thank you for the great tutorial on the watermelon chicken scratch. The pattern printed up beautifully. On my computer screen it appeared on the small side, but alas on paper it was perfect. Oops! No pictures–No video! For the watermelon runner. Hi, the tutorial – with about 25 step by step photos – is available at the link in the article above. Mary, I clicked on the link and there are no pictures at all. The links to the pictures are all broken links. Sad, because I was really wanting to see this. It’s been corrected. Thanks once again for all your hard work, Mary. I love the watermelon chicken scratch. I am annoyed with my local Hancock Fabrics and Hobby Lobby. They only carry gingham in poly/cotton blends. It is so thin, and I don’t like the way it feels at all. I will be looking at the quilting stores next and then online. Thank you so much for the wonderful tutorial! Farmhouse fabrics carries a nice range of 100% cotton ginghams with different sized checks. I have spotty luck finding good cotton gingham at fabric stores, and better luck at quilting stores. I like Farmhouse Fabrics (online) because their cottons are nice and they have a huge variety. I have the bug now. I can not download the watermelon. Please help. Hi. I love everything you do. I would like to try the chicken scratch embroidery, but I am having a hard time to find that of fabric you use. ( name of the fabric) . i know it is Gingham, but what type and where to buy? Thank you for all!! I use a 1/8″ gingham cotton fabric, which is pretty tiny for chicken scratch, but I like the more delicate results. I usually get mine from Farmhouse Fabrics – they have a large range of colors on very good cotton. Previous Previous post: Goldwork Jewelry – Kits Give-Away! Next Next post: Oh, that Needlework Bucket List!